There’s no shortage of sites in the Village and East Village where great makers of popular music lived or performed. Less well known, however, are the multitude of sites that were the backdrop for iconic album covers, sometimes sources of inspiration for the artists or just familiar stomping grounds. Today, many are hiding in plain sight, waiting to perform an encore for any passersby discerning enough to notice. 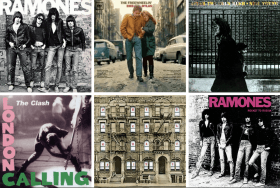 Ahead, we round up some of the most notable examples, from “The Freewheelin’ Bob Dylan” to the Ramones’ self-titled debut album.